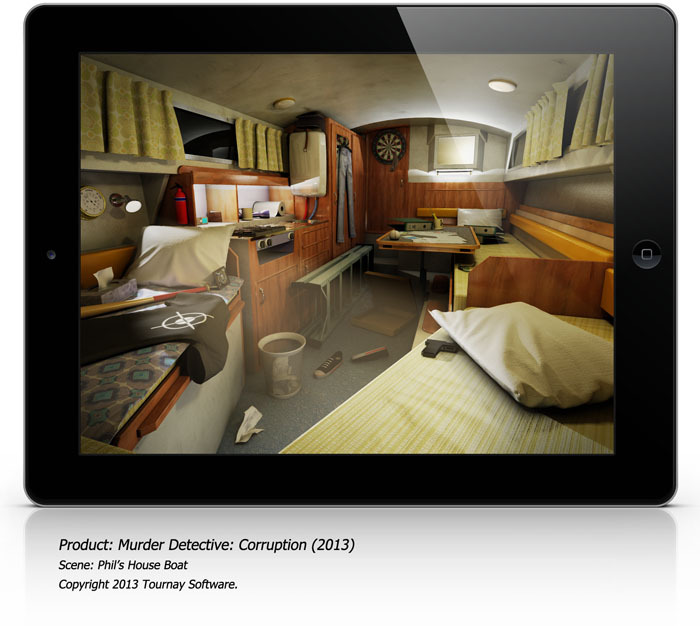 This is the first of 23 original CGI scenes that I created for Tournay Software’s ‘Murder Detective 2: Corruption’ game. This scene depicts the detective’s temporary home – an old boat stored in a boat yard. Last year’s game featured the exterior. I tried to improve the quality of the renders this year. They all have more advanced shading and atmospheric effects. They also feature a large number of objects/clues that need to be found throughout the game. So, we have a base background with lots of graphical patches to organise. I figured out some useful methods for extracting screen coordinates, semi-automating the process. I’ll post them on this site at some point as some may find them useful. The sheer volume of objects required for these scenes combined with the tight deadlines meant that I had to streamline art development where possible. When modelling would take too long, I would use photographic patches. I also made use of a small amount of licensed stock geometry. Many of the objects are modelled on items that were to hand, taking care not to infringe on 3rd party copyrights. In the later scenes, a lot of object modelling and a good chunk of scene geometry was created by fellow 3D artist Lee Kellett. I will mention this where appropriate. Be sure to check out Lee’s portfolio here.